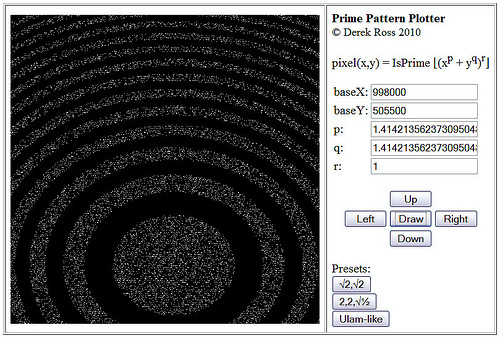 evaluates to a prime number. Scroll around a bit, and you'll find different patterns. Some strong, some weak, some with the waves grouped in twos, some grouped in sixes, and so on. The plotter needs a recent browser like Google Chrome, or Firefox 3.6. Make sure to press the [Draw] button to generate and refresh the image. These are probably the most useful and concise TeX reference cheat-sheets I've discovered in my searches. They're meant to be printed on both sides of an 8.5 x 11 sheet folded thrice. I've converted the Postscript file to gifs to make them viewable in a browser. If you're interested in the original file, you can find it here. This image encodes the first 218 Collatz values as brightness. It's easy to see some vague patterns, but what the patterns mean, I do not know. This is an image of a fourth-order permutahedron. Each of the vertices of this polyhedron, also known as a truncated octahedron, represent one permutation of the set . Each edge represents the transition from one permutation to another that may be achieved by swapping the order of two adjacent items. The permutahedron for a set of 3 items is a hexagon. The number of vertices of an nth order permutahedron is n!.